1920's to '40's roots swing music with a peppering of country music, lush harmonies, ear twisting arrangements is what this fabulous six piece band delivers. 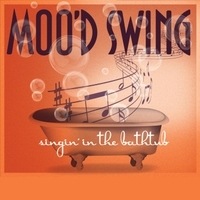 "Singin' in the Bathtub" is Moo’d Swing’s third CD release. Their arrangements, three-part vocal harmonies and crazy mix of instrumentation make for their classic sound. With some of Canada’s most renowned musicians making a guest appearance on this recording, this CD is the bands most sophisticated musical endeavour to date. If you love the old jazz standards from the 20’s and 30’s you will adore this album.